An example of a Wi-Fi network. 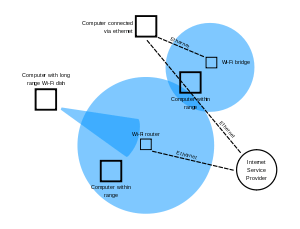 A wireless local area network (WLAN) is a wireless computer network that links two or more devices using a wireless distribution method (often spread-spectrum or OFDM radio) within a limited area such as a home, school, computer laboratory, or office building. This gives users the ability to move around within a local coverage area and yet still be connected to the network. A WLAN can also provide a connection to the wider Internet. Wireless LANs have become popular for use in the home, due to their ease of installation and use. They are also popular in commercial complexes that offer wireless access to their customers (often without charge). New York City, for instance, has begun a pilot program to provide city workers in all five boroughs of the city with wireless Internet access. Norman Abramson, a professor at the University of Hawaii, developed the world’s first wireless computer communication network, ALOHAnet (operational in 1971), using low-cost ham-like radios. The system included seven computers deployed over four islands to communicate with the central computer on the Oahu Island without using phone lines. WLAN (Wireless Local Area Network) hardware initially cost so much that it was only used as an alternative to cabled LAN in places where cabling was difficult or impossible. Early development included industry-specific solutions and proprietary protocols, but at the end of the 1990s these were replaced by standards, primarily the various versions of IEEE 802.11 (in products using the Wi-Fi brand name). Beginning in 1991, a European alternative known as HiperLAN/1 was pursued by the European Telecommunications Standards Institute (ETSI) with a first version approved in 1996. This was followed by a HiperLAN/2 functional specification with ATM influences accomplished February 2000. Neither European standard achieved the commercial success of 802.11, although much of the work on HiperLAN/2 has survived in the physical specification (PHY) for IEEE 802.11a, which is nearly identical to the PHY of HiperLAN/2. All components that can connect into a wireless medium in a network are referred to as stations (STA). All stations are equipped with wireless network interface controllers (WNICs). Wireless stations fall into two categories: wireless access points, and clients. Access points (APs), normally wireless routers, are base stations for the wireless network. They transmit and receive radio frequencies for wireless enabled devices to communicate with. Wireless clients can be mobile devices such as laptops, personal digital assistants, IP phones and other smartphones, or non-portable devices such as desktop computers and workstations that are equipped with a wireless network interface. IEEE 802.11 defines the physical layer (PHY) and MAC (Media Access Control) layers based on CSMA/CA (Carrier Sense Multiple Access with Collision Avoidance). The 802.11 specification includes provisions designed to minimize collisions, because two mobile units may both be in range of a common access point, but out of range of each other. A Wireless Distribution System enables the wireless interconnection of access points in an IEEE 802.11 network. It allows a wireless network to be expanded using multiple access points without the need for a wired backbone to link them, as is traditionally required. The notable advantage of WDS over other solutions is that it preserves the MAC addresses of client packets across links between access points. 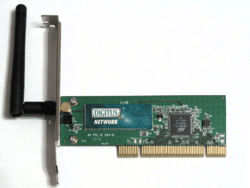 WDS may also be referred to as repeater mode because it appears to bridge and accept wireless clients at the same time (unlike traditional bridging). It should be noted, however, that throughput in this method is halved for all clients connected wirelessly. Internal Roaming: The Mobile Station (MS) moves from one access point (AP) to another AP within a home network because the signal strength is too weak. An authentication server (RADIUS) performs the re-authentication of MS via 802.1x (e.g. with PEAP). The billing of QoS is in the home network. A Mobile Station roaming from one access point to another often interrupts the flow of data among the Mobile Station and an application connected to the network. The Mobile Station, for instance, periodically monitors the presence of alternative access points (ones that will provide a better connection). At some point, based on proprietary mechanisms, the Mobile Station decides to re-associate with an access point having a stronger wireless signal. The Mobile Station, however, may lose a connection with an access point before associating with another access point. In order to provide reliable connections with applications, the Mobile Station must generally include software that provides session persistence. External Roaming: The MS (client) moves into a WLAN of another Wireless Internet Service Provider (WISP) and takes their services (Hotspot). The user can independently of his home network use another foreign network, if this is open for visitors. There must be special authentication and billing systems for mobile services in a foreign network. 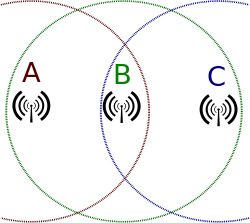 WLAN, organised in various layer 2 variants (IEEE 802.11), has different characteristics. Across all flavours of 802.11, maximum achievable throughputs are either given based on measurements under ideal conditions or in the layer 2 data rates. This, however, does not apply to typical deployments in which data are being transferred between two endpoints of which at least one is typically connected to a wired infrastructure and the other endpoint is connected to an infrastructure via a wireless link. This means that typically data frames pass an 802.11 (WLAN) medium and are being converted to 802.3 (Ethernet) or vice versa. Due to the difference in the frame (header) lengths of these two media, the packet size of an application determines the speed of the data transfer. This means that an application which uses small packets (e.g. VoIP) creates a data flow with a high overhead traffic (e.g. a low goodput). Other factors which contribute to the overall application data rate are the speed with which the application transmits the packets (i.e. the data rate) and the energy with which the wireless signal is received. The latter is determined by distance and by the configured output power of the communicating devices. 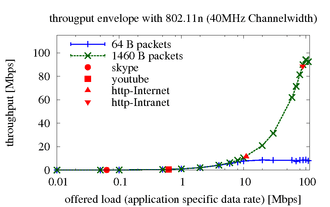 Same references apply to the attached throughput graphs which show measurements of UDP throughput measurements. Each represents an average (UDP) throughput (the error bars are there, but barely visible due to the small variation) of 25 measurements. Each is with a specific packet size (small or large) and with a specific data rate (10 kbit/s – 100 Mbit/s). Markers for traffic profiles of common applications are included as well. This text and measurements do not cover packet errors but information about this can be found at above references. 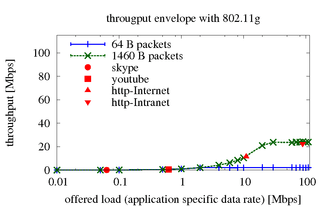 The table below shows the maximum achievable (application specific) UDP throughput in the same scenarios (same references again) with various difference WLAN (802.11) flavours. The measurement hosts have been 25 meters apart from each other; loss is again ignored. ↑ "NY Muni Wireless Network Launch in Sight". Internet News. Retrieved 2010-11-03. ↑ "History of Wireless". Johns Hopkins Bloomberg School of Public Health. Archived from the original on 2007-02-10. Retrieved 2007-02-17. ↑ Wayne Caswell (November 17, 2010). "HomeRF Archives". Retrieved July 16, 2011. ↑ Wireless Distribution System Linked Router Network DD-WRT Wiki. Retrieved December 31, 2006. ↑ "How Wi-Fi Roaming Really Works". Retrieved 2008-10-09. ↑ "Towards Energy-Awareness in Managing Wireless LAN Applications". IEEE/IFIP NOMS 2012: IEEE/IFIP Network Operations and Management Symposium. Retrieved 2014-08-11. ↑ "Application Level Energy and Performance Measurements in a Wireless LAN". The 2011 IEEE/ACM International Conference on Green Computing and Communications. Retrieved 2014-08-11.